So you're headed to Disney and have decided against wearing a shirt that says "The Smith Family Does Disney 2016" (or maybe you'll do that?). But anyway, for those looking to have their kiddos wear the part while at Disney, I've found some options for Clothes for Disney for under $20. These are current prices and links may be affiliate. While this Ships from China, it is for $14 SHIPPED. Order with 3 weeks notice. 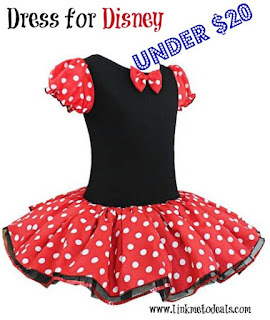 For $10 your girl can dress up like Mini Mouse! Awesome! $15 for your boy to look cool too!